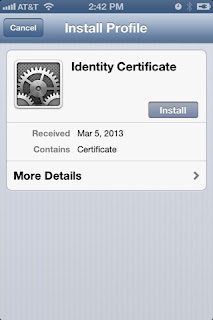 How to install an Email Digital Certificate to the iPhone or iPad? If you have a copy of your Email Digital Certificate exported to .p12 extension and still remember your password. Then, you are ready to proceed installing your Email Digital Certificate to your iPhone or iPad. First compose a new message, attach your email digital certificate, and it should be in .p12 extension, and send it yourself. 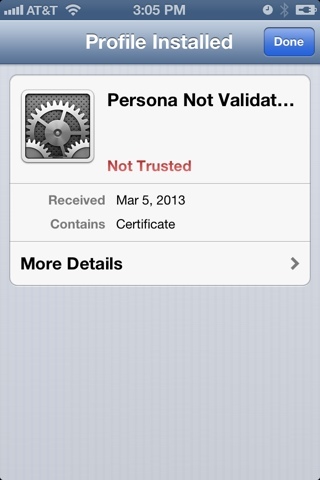 Check new email using your iPhone with your digital certificate. Touch the attachment, and it will start the process of install your email digital certificate to your iPhone (or iPad). In Install Profile, touch the Install button. 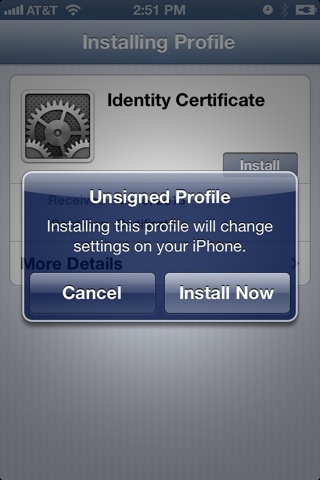 It will prompt you the "Unsigned Profile", touch Install Now. It will prompt you to enter your iPhone (or iPad) passcode. Then Enter the password for the certificate "Identity Certificate". The password was created during the creation of your email digital certificate. 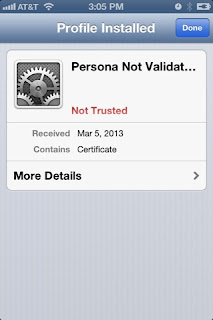 Top or Touch More Details, Certificate, and it will show the details about your Common Name "Persona Not Validated", your email address, Organization Unit Name, and other security settings. Touch Done to complete the installation. Now you can use your iPhone or iPad to sign and read an encrypted email. Continue reading the "How do I sign and encrypt my email using my iPhone or iPad?"